Randy Johnson assumed the duties of Superintendent at the Denver Mint in 2017. From his 30 years of federal service, Randy brings a wealth of knowledge and experience to the job, and he continues to keep the Denver team focused on achieving the Mint’s mission. 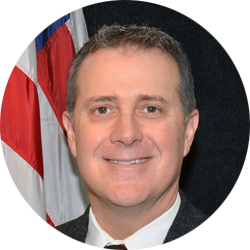 Prior to his current role, Randy served as the Acting Superintendent and Deputy Superintendent. Randy’s professional background is extensive, both at the U.S. Mint and in the Department of Defense. Randy started in government in the Department of Defense as an Engineer at Fort Devens, MA in 1989. He later was promoted to a Branch Chief at Ft. Meade, MD. Randy joined the U.S. Mint team in 1997. He was originally hired with the Mint as a Supervisory General Engineer in the Plant Engineering Division, and later held several management positions. During this time, he served as Division Chief for both the Coining and Die Manufacturing Divisions. He led the Coining Division during our record setting peak production years in the late 1990’s, and initiated many innovations while later serving as the Die Manufacturing Chief. Randy is a graduate of the Department of the Treasury’s inaugural Senior Executive Service (SES) Candidate Development Program, and holds an Engineering degree from Geneva College in Beaver Falls, PA.